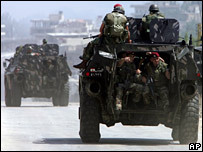 Intense fighting has raged for a second day between troops and Islamic militants at a Palestinian refugee camp near the Lebanese city of Tripoli. At least nine civilians died during clashes at the Nahr al-Bared camp, home to some 40,000 Palestinian refugees. 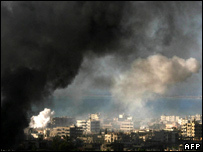 Thick plumes of black smoke clogged the skies over the camp as night fell after a day of shelling and artillery fire. The army vowed to stop shelling Fatah al-Islam, suspected of links to al-Qaeda and Syria, if it stops firing. Sources said militants had pledged to withdraw from positions facing Lebanese troops after negotiations with Palestinian militant group Islamic Jihad, although sporadic fire continued despite the reported truce. 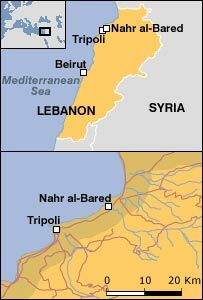 The Fatah al-Islam group had threatened to widen its campaign unless the Lebanese army stopped the shelling. Red Cross officials have appealed for a truce to let aid agencies reach those worst affected by the violence. The BBC's Jim Muir, in Beirut, says that in addition to the desperate need for medical relief within the camp, electricity supplies have been cut and there is limited water. A planned two-hour ceasefire on Monday ended after just a few minutes, with clashes resuming before United Nations and Red Cross vehicles could enter the camp. Medical workers have only been able to evacuate 16 of the many injured civilians and sick trapped inside the camp. The UN Secretary-General's special envoy, Terje Roed-Larson, condemned the violence as he met Egyptian President Hosni Mubarak after presenting a report on Lebanon to the UN Security Council. US President George W Bush told Reuters that the Islamists needed to be stopped, "Extremists that are trying to topple that young democracy need to be reined in," he said. He added that he was not going to accuse Syria of being involved in this particular conflict until he had better information. Syria's ambassador to the United Nations, Bashar Jaafari, denied his country had any link to the group, and said some of them had been in jail in Syria for their support for al-Qaeda. In a separate incident on Monday, a bomb exploded in an upmarket area of the Lebanese capital, Beirut, injuring at least six people. The fighting, which began on Monday, is the bloodiest internal conflict in Lebanon since the civil war ended 17 years ago. On Sunday, 50 people were killed at the camp, which houses about 40,000 Palestinian refugees. The clashes erupted when security forces tried to arrest suspects in a bank robbery. Militants from Fatah al-Islam then attacked army posts at the entrances to the camp. The Lebanese army regained control of the camp's perimeter but clashes have continued. Lebanon is clearly determined to eradicate Fatah al-Islam but the militant group is well armed, highly motivated and well dug in, our correspondent says. Civilian casualties have not been confirmed by the Lebanese authorities which, under a 38-year-old deal, are not allowed to go into the camp. Lebanon is home to more than 350,000 Palestinian refugees, many of whom fled or left their homes when Israel was created in 1948. Fatah al-Islam is a radical Palestinian splinter group alleged to have links with al-Qaeda. Lebanese officials also believe it has ties to Syrian intelligence. Other Palestinian groups have distanced themselves from Fatah al-Islam. There are rival theories about what lies behind the latest violence, says the BBC's Roger Hardy. Government ministers suspect Syria is behind the violence, with the aim of destabilising the country. Others see a quite separate radical Islamist agenda, our correspondent says.